The book is structured so that following the chapters in order leads to building a fully functioning and live trading PrestaShop. Guidance is also given should you wish to learn or practice your skills in an offline, non-trading environment. Every chapter contains clearly structured and illustrated step-by-step explanation to achieve the goals discussed. Nothing is left for readers to work out themselves, but it would be very simple for them to use the information to go beyond the specific tutorials, should they wish to do so. There is optional additional reading, including more than a dozen specifically written downloadable e-books made available on the book's support website just for readers of PrestaShop 1.3 Beginners Guide. 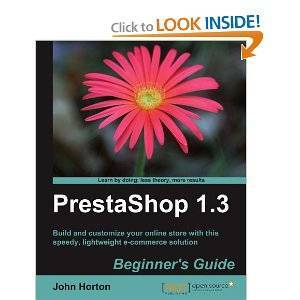 This book is for anybody who wants a fully functioning e-commerce store using PrestaShop. You do not have to have any previous knowledge of PrestaShop or any aspect of e-commerce or business in general. If you do, then you will probably find this guide really valuable as well. The book covers all you need to know about starting your own e-commerce business.